Kendo or "way, 道(do), of the Sword, 剣, (ken)", is the martial art of Japanese fencing. Kendo developed from traditional techniques of Japanese swordmanship known as kenjutsu. The Concept of Kendo is to discipline the human character through the application of the principles of the katana (Japanese sword). Kendo is a physically and mentally challenging activity that combines strong martial arts values with sporting-like physical elements. Kendo embodies the essence of Japanese fighting arts. Kendo players fence with flexible bamboo practise swords (shinai) using both the edge and point of the sword to hit targets on their opponent's armour. 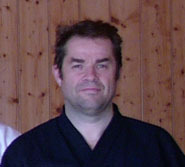 The four main targets are the top of the head, the throat, the abdomen and the wrist..
Philippe started Kendo in 1987 in Paris with Pierre Delorme Sensei, but for futile reason: work, family relocation in USA then in UK... he stopped in the 90’s. Around 900 AD, Japanese smiths developed the curved samurai sword by improving on earlier Chinese and Korean designs. 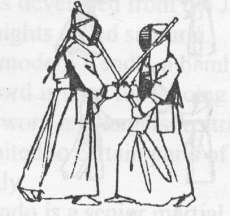 This was the start of the Japanese style of fencing, as the shape and size of a sword influence the techniques used to wield it. The finest swords were made around 1300 AD and fencing schools exist today which date back to that period. The main influence of modern Kendo, Itto-ryu, dates to the 15th century. Fencing was originally practiced with a steel or wooden swords, often resulting in serious injury to the fencers. Around 1750, Chuto Nakanishi devised a bamboo practise sword and light practice armour. With the new equipment, fencing could be practiced at full speed with only the danger of bruises. By 1780 the equipment had been refined to looked very much as it does today. However the focus of the practice was still more on battlefield technique than philosophy and sport; Kenjutsu rather than Kendo. During the Meiji restoration, when samurai were forbidden from wearing swords in public, and after World War II when all military activities were banned, swordsmanship declined in Japan. In both cases the battlefield training was evolved into an activity more suitable for peacetime, and so modern kendo with its emphasis on sport and spiritual growth was born.